Two and half weeks ago, the 84th Major League Baseball All-Star game was played in Citi Field out in Flushing, Queens. For months, I did what I could to get a ticket to an event that will probably not take place again in New York for at least 20 years. The Mets website was the first place I looked back when there was still snow on the ground, but they wanted anyone who was interested in attending the Midsummer Classic to also buy season tickets for the Amazin’s 2013 campaign. No one in my Taxi was able to hook me up and even though I knew someone who worked the Fanfest at the Javits Center, there was still no word of a $600 or $800 chance to take off for a night and ride the #7 train out that night to see Baseball’s best slug it out. I ended up not working that night but thankfully, was able to come home and watch Mariano shut down the side and earned a well-deserved MVP in his final All-Star appearance. Once in a while, I get that question posted at the top of this entry tossed at me. As I’ve alluded to many times, my passengers love to ask me question after question after question after…well, you get it. 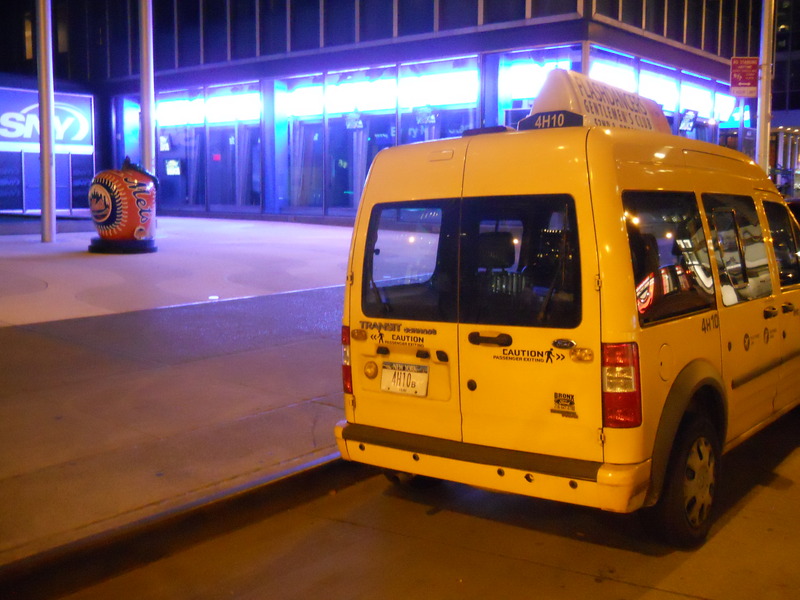 It’s bad enough that it’s usually the same variations of what I’ve already answered that night (Do you own this Taxi? How late are you out here? Anyone ever get it on back here? etc…) but the one up top is one of the few that I haven’t gotten around to looking up the answer to yet. Time and time again, I’ve referred to the city that I work in by its nickname, even though I don’t hear or see it as much as when I was growing up. Like graffiti, down-on-their luck starving artists, the Broadway font, and Milton Glaser’s I Love New York ad campaign being sung in the background, The Big Apple seemed to be depicted a lot more in the waning decades of the 20th Century. 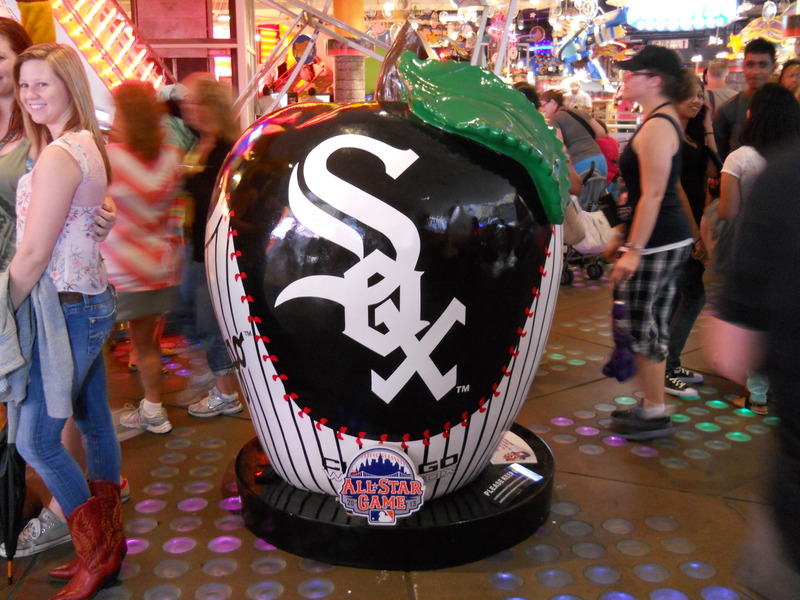 Heck, even the ball in Times Square was an apple for a period during the 1980’s, before returning back to it’s more familiar form. Yet throughout all of this, the nickname for New York has stuck. But why not The Big banana, or even enchilada? 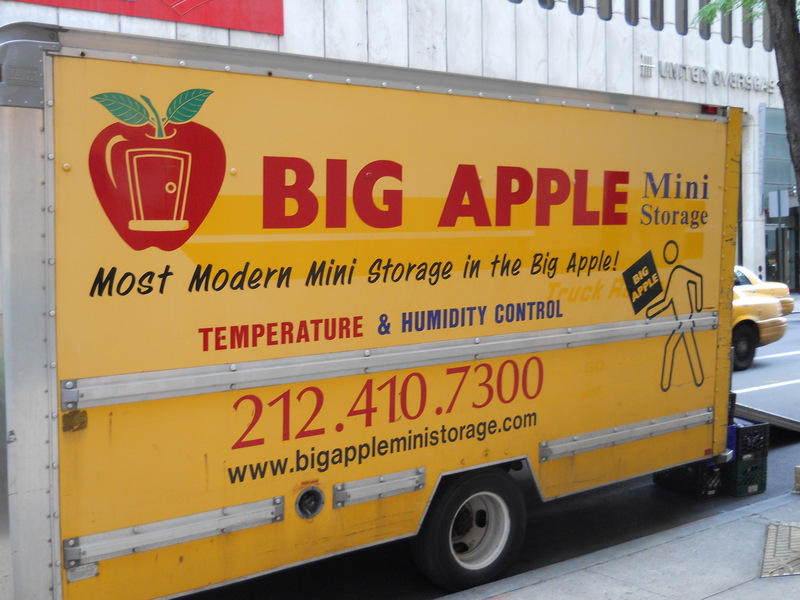 There isn’t one answer but whether it’s because of horses, jazz clubs, or even a brothel, there isn’t a soul that sets foot in the 5 Boroughs today that doesn’t know the link between apples and the City that has adopted them as an official moniker. 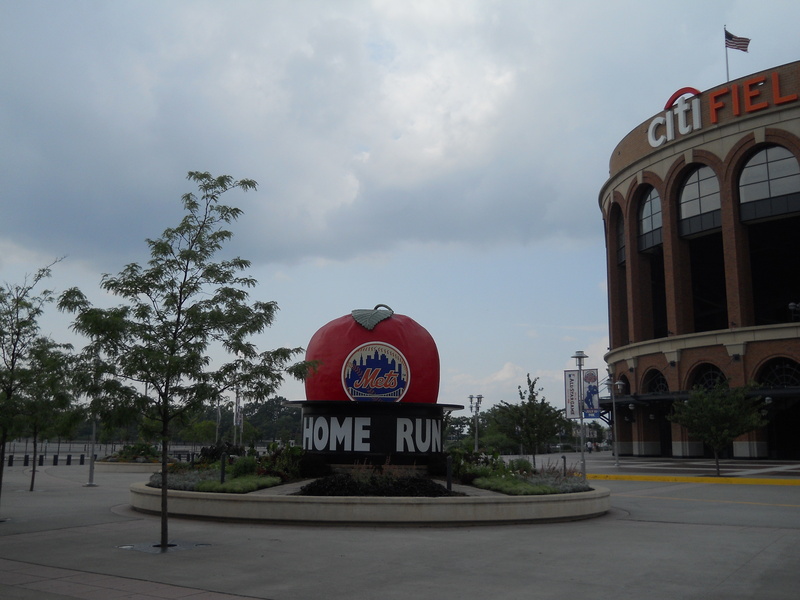 The bond has become so synonymous that in 1980, the Mets even came up with a way to use the apple for themselves. 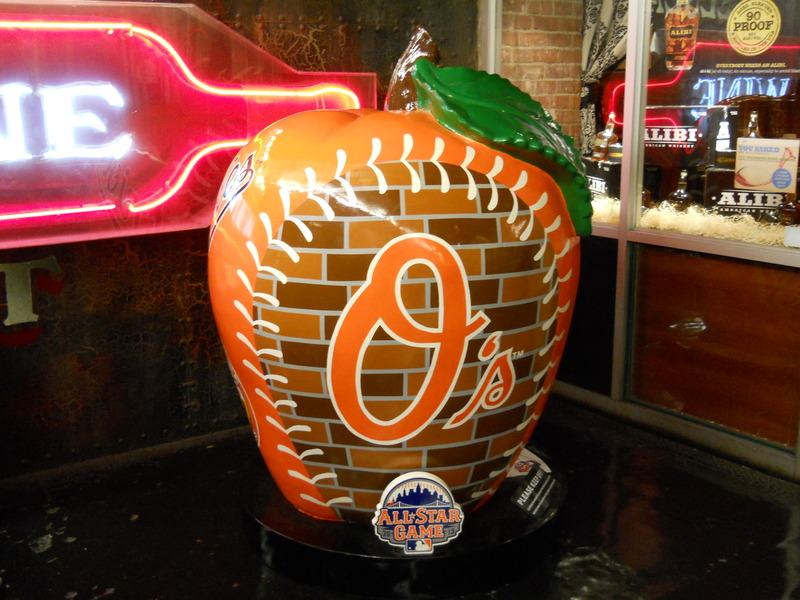 Milwaukee may have Bernie Brewer taking a slide into a vat of beer and the south side of Chicago had an exploding scoreboard but after every home run hit by a Met, a giant Apple would pop out of a hat on the other side of the outfield wall. 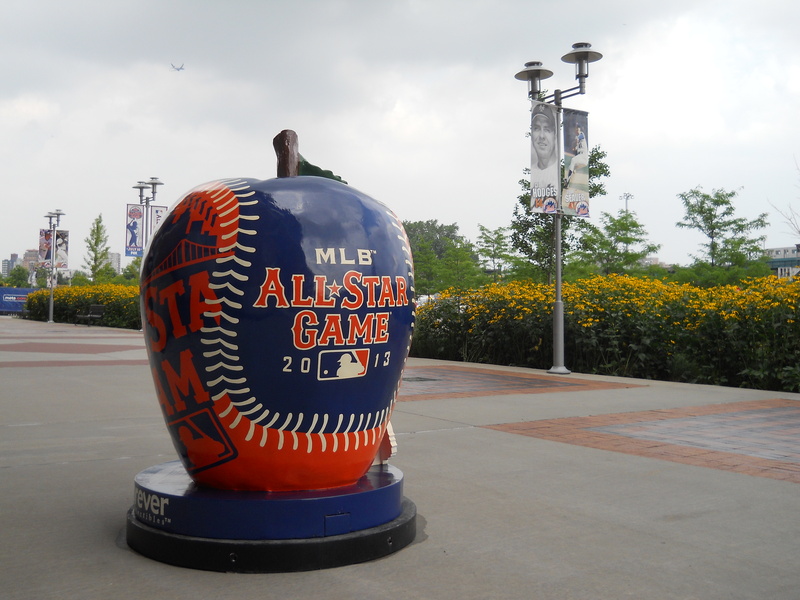 It was with that in mind that Major League Baseball decided to celebrate this year’s All-Star game by putting – what else – apples, all over the city. Lots of ’em, with the logos of the 30 Major League clubs and a few other designs tossed in for good measure. Why am I even putting this in here? Because yours truly tracked all 35 of them down the week before the big game. 5 years ago, something similar was done for the Yankees. The House that Ruth Built up in the Bronx was hosting the All-Star game that year and during (the first) Yankee Stadium’s 86th and final season. As part of the festivities leading up to that 15-inning classic, a bunch of Statues of Liberty were put on parade around the City, as well as on Ellis and Liberty Islands. Being such a rabid baseball fan, I hunted every single one of these down, snapped a picture of it, and posted them all up online before I took off for the Summer to watch a bunch of Minor-League games on the road. I didn’t have a chance to buy any tickets for the game in the Bronx, but I’ll never forget turning on the radio in my Mustang and listening to the latter innings on AM radio in the wee hours of the morning, underneath the stars. That was not the case this year but thankfully, I was able to visit firsthand all of the apples that were spread out and about. I had seen a few while driving around during my shift and on my off days, I took out the map that was printed in the paper and proceeded to find every one and cross it off, before pounding the pavement and moving onto the next. The hardest part was getting a nice shot of one without any distractions and given that so many were placed in high-traffic areas, that was easier said than done. Most people would wonder what would lead someone to do such a crazy thing. 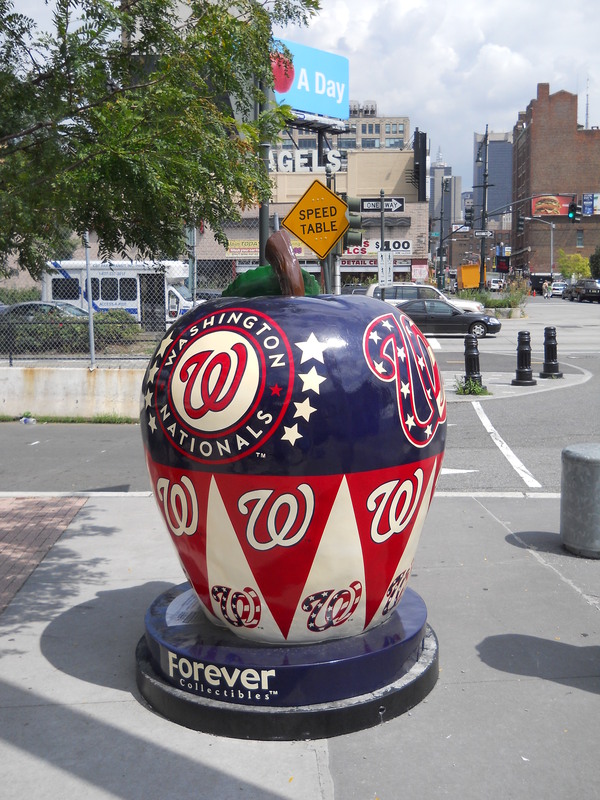 Yes, I’m a huge fan of our national pastime and, yes, I probably had better things to do during my off days than to chase a bunch of fiberglass apples around New York during the heat of Summer. For me, it was part scavenger hunt, part checklist, and part walking tour. Some of them were in areas that I hadn’t been on foot in in quite a long time and they allowed me to get reacquainted with parts of the City that I was only familiar with from behind the dash. 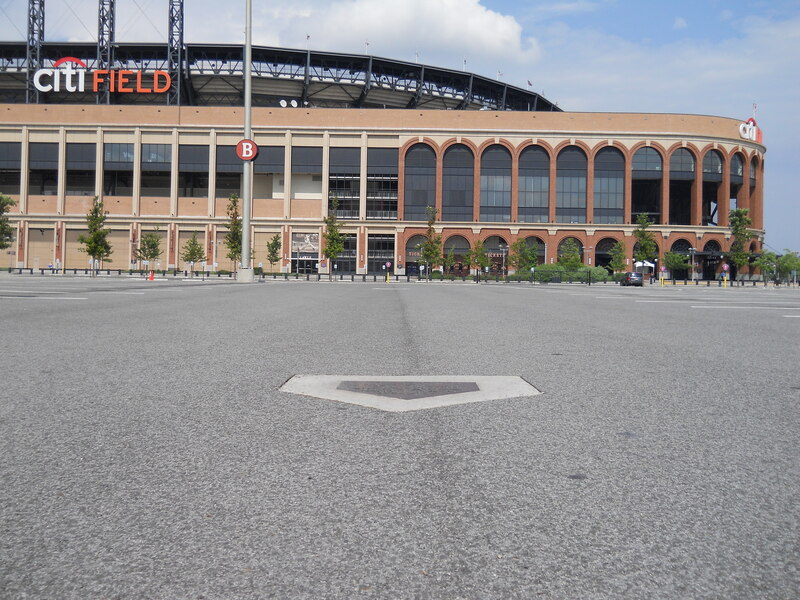 The All-Star apple was out at Citi Field and since I went out to see it when the Mets were away from town, I found the old Shea base paths in the parking lot and re-enacted the last out of the ’06 NLCS. A few others were on the far East and West Sides of Manhattan, which are practically no-man’s lands for pedestrians unless they’re on the way to somewhere specific in those parts of town. 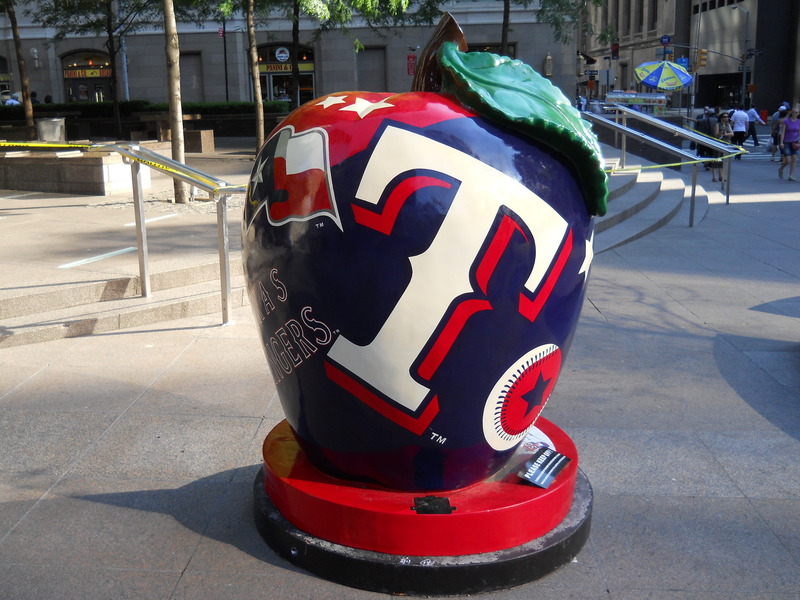 The Houston Astros Apple was in front of the Helmsley on 42 Street, which is where I dropped off National League All-Star closer Craig Kimbrel the night before the game. Several were down in Lower Manhattan, which sadly did not look much different than when I was down there in ’08 (except for 1 WTC being nearly complete the second time around). A big part of the allure of the whole parade was chasing them down on foot, which is how I learned my way around New York for years before I took the current job that I still hold. I’m sure some people reading this will wonder why a 36 year-old Cabdriver even cares this much about a kids game played by overpaid drug addicts and egomaniacs and yes, I’ve often wondered the same thing myself. Given that I’ve seen cops ride on sidewalks, a video being filmed in the middle of 8 Ave. during rush hour traffic, and several fights and arrests while waiting at red lights during my last full week on the job, I realize that sports and recreation is one my ways of escaping the madness that so many of us who drive around New York have to put up with on a daily basis. No, they don’t solve problems, win wars, cure diseases, or make a difference in our day-to-day lives but sports are a big business in this country today and are a diversion during a time where so many of us have so much weighing us down. A nation’s lonely eyes once turned to Joltin’ Joe and for me my eyes will turn to many images, texts, people, and yes, activities when the nights grow long and the outlets are few for me to reach out to. A little over 20 years ago, Time magazine did a cover story on “The Rotting Apple”. I was in 8th grade and read this issues in the Middle School Library when this came out – murders were at 2,000 a year, the Budget looked like it wouldn’t be balanced, people were once again fleeing for greener, suburban pastures, and race riots dotted many inner-city neighborhoods. Newly-elected major David Dinkins had his hands full and it looked like New York’s best days were in the rear-view mirror once again. Thankfully, that did not turn out to be the case but it took a massive infusion of capital, resources, a political shift in the City’s electorate, and a renewed questioning of New York’s role with the rest of America after 9/11 to bring Gotham back to prominence. No, it’s not a perfect place and much work has to be done to make New York the leader in innovation and immigration in the 21st Century but landing two All-Star games and having a unique form of public art on hand this Summer to make the steamy nights a bit easier for me to handle was another visible sign that the place that I call home during my working hours was on the right track and in much better shape than it was a generation ago. It seems like so long ago and maybe when the next All-Star game is held in New York again in the 2030’s or 2040’s, someone will take out all of the apples out of mothballs and introduce them to a new generation of visitors, many of whom will find it hard to believe that the Big Apple was on the brink of insolvency and irrelevancy during the lifetime of some of its inhabitants. Four summers ago, I uttered those words, nearly 100 times. At Minor League parks in 35 states, yours truly was crazy enough to take a whole summer off and watch a bunch of games surrounded by solitude, strangers, and starry skies. A lot happened in the years leading up until March of this year, including a grueling end to my career at Columbia, a renewed love for New Jersey’s finest, and the odyssey behind the wheel that I decided to indulge myself in on a daily basis in the Big Apple. All of that threatened to consume me, leaving a soulless shell in it’s wake. Thankfully, I hit the pause button earlier this month. As some of you were aware of, I put my hack license away a few weeks back and headed out west. 6 days – all alone – in the Valley of the Sun. Most people just call all of it Phoenix but in actuality, it also encompassed Tempe, Glendale, Mesa, Goodyear, Chandler, Scottsdale, and a few other points in between. I had it it planned for a while, since the World Baseball Classic and Spring Training were in full swing during this time. In past years, it was the Summer when I decided to leave everything back east behind and set sail for greener pastures and open spaces in the direction of the setting sun. It had been 3 1/2 years since those days were a part of my life and if only for a fleeting glimpse, I decided to pick up where I last left off, which was watching fireworks post-game for the Hudson Valley Renegades at the end of a 1oo-day, 100-game baseball trip in 2009. Most people reading this can’t see how this would relate to my current profession but the seeds of it were sown during my first runs out of state years ago, when I fell in love in driving and thankfully, I felt that connection again when I was behind the wheel of my rental car leaving Sky Harbor Airport, even if I wasn’t able to put the top down on it this time around. I knew it wasn’t going to be fully possible to fully escape the East Coast. If not by proximity, than certainly by the indelible traits that cabdriving and urban living had left upon me. As the old saying goes, “You can take the boy out of “X” but you can’t take the “X” out of the boy”, and unlike past years, I made it out to the Mountain Time Zone in a matter of hours, and not days spent on back roads. If that wasn’t odd enough, the events of the first day were. Every first day seems to go haywire for me. In nearly every job, I’ve had to hit the ground running. Ditto for my time at Columbia since I transferred into G.S. with most of my introductory courses out of the way beforehand. Even in New York, I saw an accident and had runs to 3 Outer Boroughs on my first night, along with a ton of well-wishes from my English-speaking passengers. Nearly every road trip that I took during the summer saw my original plans get chucked out the window due to weather, traffic, and the nearest empty hotel room being 30 miles away from where I planned on retiring for the night. 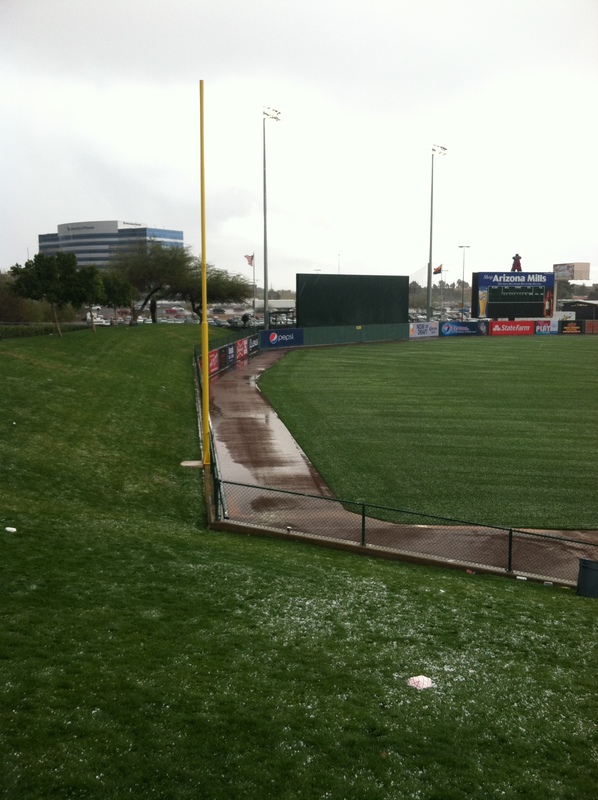 And once again, things weren’t any different on a March Friday in Arizona. Ever take the middle seat on a train? I didn’t think so and I nearly did on my flight out until the person to my left offered to switch with me to be next to his friend. It was all for the better as my one piece of luggage was stowed underneath since all of the overhead compartments were full. At least I didn’t have to worry about it falling out during take-off after the 40-minute long de-icing was finished, as my magazine was enough to keep me busy once up in the air. The problem with that arose once I landed and made my way over to the carousel to pick up my bag and head towards the rental car area. A few minutes later, no sign of it. My flight left out of J.F.K. at around 8 so you can only imagine how I felt given that that was the average time when I went to bed on most nights…er, days. 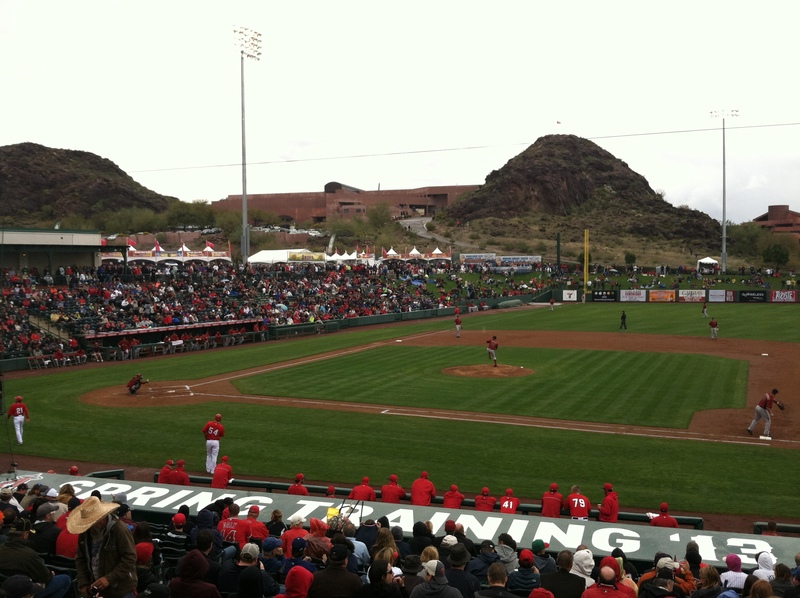 One less than 4 hours sleep, I picked up my breadbox on wheels and made my way towards Tempe Diablo Stadium. 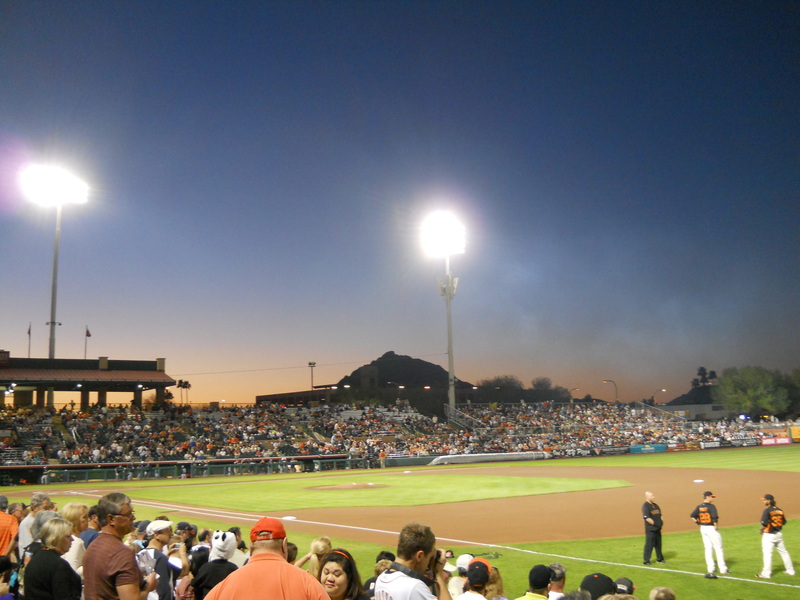 That facility was notable since it was the only stadium in greater Phoenix where I witnessed a game back on ’09. I had a few others on my itinerary but an errant check engine light and a broken fuel pump (don’t ever break down in Tuscon in July) put an end to my baseball plans in the Grand Canyon State that Summer. This time around, I planned on picking up where I left off. I had a World Baseball Classic, Coyotes, and Suns game, on the agenda as well as 8 spring training games on the slate and nothing was going to stop me, even if all I had was the shirt on my back. Absolutely nothing, not even a freak hailstorm. Which is exactly what came during the third inning of the Angels game. It may never rain in Southern California and it’s sunny 300 days a year in Arizona but sure enough, it was 50 degrees and hailing the day I landed. A few attempts to pull the tarp on and off the field was enough to frustrate the grounds crew as they gave up for good once the storm hit. It doesn’t get more bizarre than watching something frozen fall on a cactus but I had the pleasure of witnessing it firsthand within a few hours after touching down. 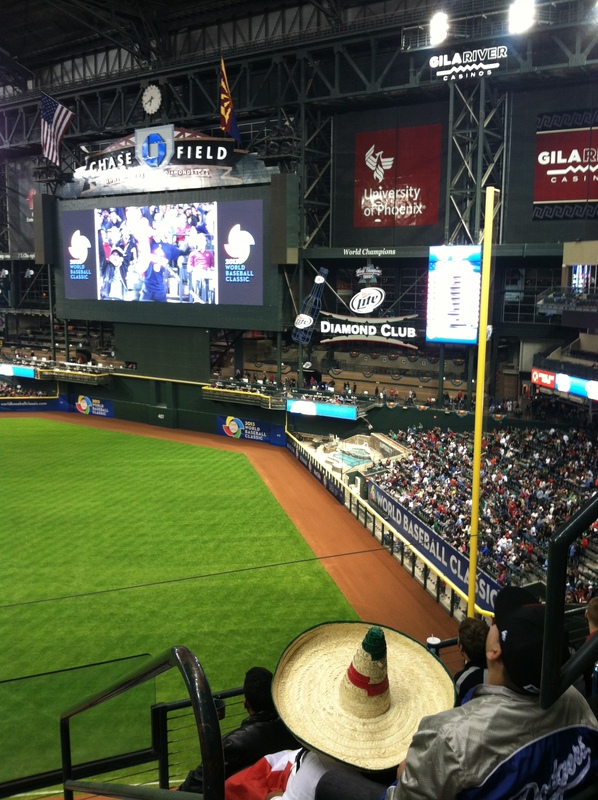 That night was the only game of the World Baseball Classic that I saw without getting kicked out of Chase Field and it didn’t go much better. R. A. Dickey finally met his match and so did anyone cheering on the red, white, and blue, as both were clearly outplayed and outdone by anyone wearing red, white, and green. I didn’t have the problem with my home team losing, I had just wished that the people cheering on the team they lost to moved here legally and didn’t get rottenly piss drunk during the game. There weren’t any fights that broke out (unlike their game against Canada the next day) but ask anyone in Arizona why the border has a 50 foot-high barbed wire wall along it and they’ll give you the straight dope on immigration there. Slowly but surely, the weather improved over the next 5 days. Heck, it even started to feel like the summer. No yelling at passengers, grumbling over the latest run down Bushwick Ave., or griping about the $100 bill someone gave me on a $10 fare out there. Instead, it was tan lines on my feet, learning where the nearest Walmart and QT’s were, and scrambling across town to make the first pitch for the game that evening. I even had my old Ron Cey glove with me that I was given as a kid, as a reminder of the old man and how my family introduced me to the game that I couldn’t get away from. Like my skin, it was starting to look cracked, discolored in spots, and indicative of the years, but certainly felt as comfortable and reassuring as ever. There was nothing like watching the sun come out and give me something to look forward to, while taking me back to more innocent times. I lost count of the instances in New York where someone asked me how I went to school and ended up schlepping them across town for a living. I would always give the usual spiel about the economy, my loans, and doing something that I loved to get me through the onslaught of factors that conspired to do me in. In reality, it was much more complex than that. Growing up in the shadow of the Big Apple made me yearn for something that I wanted to be a part of but didn’t have in my everyday life. Wanting to see the republic that the Greatest City in the World called home led me to drive across it numerous times, in my feeble attempt to be a modern-day Lewis and Clark or Kuralt. And cabdriving fit both of those bills nicely. New York City has over 6,000 miles of streets but over the course of my year and a half on the job as a hack, I’ve probably covered 10% of those. Because Manhattan is the primary turf for yellow cabs, much of the city remains as a frontier to me, even to this day. Just as anything west of the Delaware River was foreign to me until the mid-90’s, the City north of the Harlem River or east of the B.Q.E. still remains a wonderland to me, waiting to be explored and learned one fare at a time. The rest of America is still on that level for me as well, even though I’ve had my feet touch the Pacific Ocean more than once. Going through an area may open it up to my common knowledge but it takes a few repeat visits to get it down front and back and nowhere was that more apparent than when I made my way out west to watch my games. Like New York, greater Phoenix is laid out on a grid…except that the one out there is more in tune with Southern California’s than the more famous one back east. Each major street was one mile away from the next one, resulting in a checkerboard pattern that still threatens to encompass everything in the valley out to Goodyear, Surprise, and Chandler. High gas prices and a housing market that still is drying off from its underwater sojourn were no match for the dynamo that has now made Phoenix America’s 5th-largest city, which was evident from the stakes in the ground on the outskirts of the valley. In past years, I was only in one part of the country for a few days before leaving town on the edge of a given day and hurling myself to my next destination. This time around, it was different. I had one central point that I returned to every night and had to base everything off of it, which was not that much different than what my current job entailed. While no one would ever mistake downtown Phoenix for Midtown or the Financial District, there was something on the roads that reminded me of home. Not one of them that I saw out there was yellow but they had a lot in common with the ones that I called home during working hours. Meters, sedans, and ubiquity were all found in the valley of the sun and even though I never had to hail one, I wasn’t too far from them either. That’s probably because I spent my free time at sporting events and late night spots, which is where they were to be found in a decentralized metropolis. I had no idea what the rates were but between them and the new light rail line that was put in, it was refreshing to see a city vastly different than New York take a cue from it in order to handle transportation for the working masses. That turned out to be my only contact with an on-duty Taxi driver, during my night in Scottsdale. Most of the restaurants had stopped serving food once the Giants game let out for the night but that didn’t stop me from taking a walk through the downtown and soaking one on of the few pedestrian-friendly enclaves near the Cactus League parks. Most of them were set in relatively anonymous locales, near a major intersection marked by Gas Stations, chain drugstores, strip malls, and taco outlets. The only thing more bizarre than seeing these on the drags near the ballpark was passing the same 5 or 10 places on every major corner on the way home, with the occasional cab racing by me for good measure. 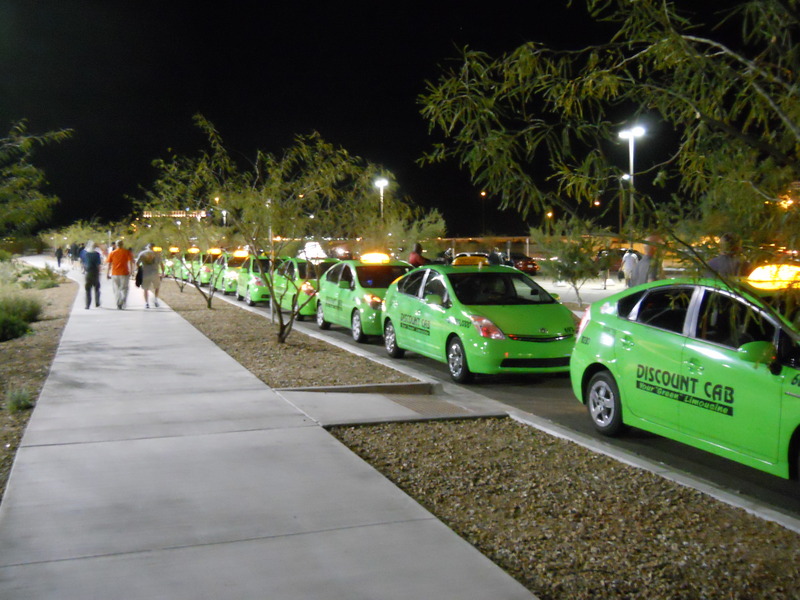 On One the last full night I was in town, I chatted with a few cabbies that were in the line pictured below. I told them what I did and they responded by saying that they liked their jobs, knew where to go for fares, and also were able to take street hails and pre-arranged rides in their Taxis (something we need to solve back east). The Prius hybrids were good on gas too, which was a bonus given that prices were higher out west and the amount of distance covered in a shift could be quite cumbersome at times. As I made my way to my rental car after the Diamondback’s game, I took a little time to myself before calling it a night and packing to head home. Loop 101 was right by the park and for anyone familiar with the Valley of the Sun, it’s the recently constructed highway that serves as the beltway for Phoenix. Parts of it went right through areas recently developed in anticipation of the highway but there were still pockets along it that went through sparsely developed blocks that hadn’t yet met the whirl and din of jackhammers and cranes. It was relatively close to the ballpark where I took my wheels and found one of these spots, parking the vehicle and going out for a stroll in the eerie calmness of a warm Arizona night. For a few minutes, I was able to see the stars, hear myself think, and resist the tide of overdevelopment that threatened to engulf everything in the middle of the state, right up to the edge of the mountains. It was at this time where I felt at peace with my current place in life, the trip I took, and what I had my life when it came to what I earned and who I had on my side. While it was only fleeting, it was something that I could always hold onto once I departed from the sunny days and disposition that I had enjoyed out west. Especially when I had to trudge out to J.F.K. in the snow during my first shift after returning home.